Move over Street Car. Washington, DC, has a new public transit proposal: a gondola. 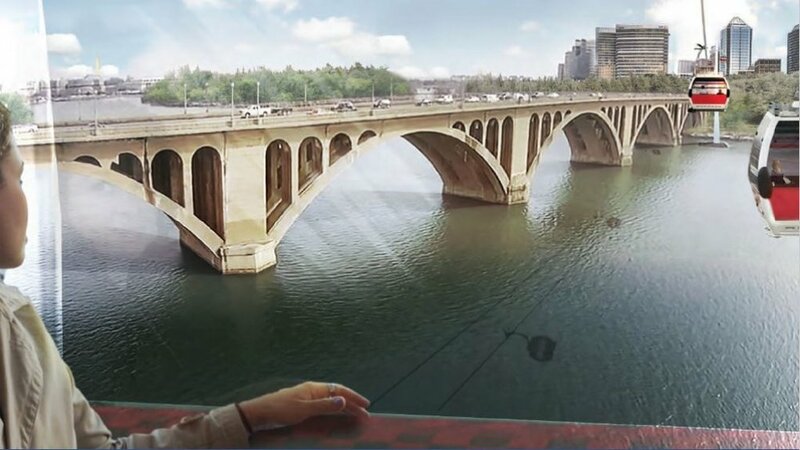 Stretching across the Potomac River near the Key Bridge, the proposed gondola would connect Georgetown in DC and Rosslyn in Arlington. Though a gondola might sound more like a tourist ride at Disney World or transportation for ski resorts, officials are pitching the idea as a legitimate solution for local traffic woes. “The Key Bridge is one of the most congested and unreliable connections across the Potomac,” said Terry Owens, public information officer for the DC Department of Transportation. Supporters of the plan say constructing a gondola system is a cheaper, and faster, alternative to constructing a new metro station in Georgetown. Local leaders recently commissioned a $200,000 study to explore the feasibility and effectiveness of a gondola. The Georgetown Business Improvement District was the largest funder, contributing $75,000 toward the cost of the study. ZGF Architects, the company behind the study, says the gondola could carry 6,500 people a day, and reduce travel time across the Potomac significantly, from between 10-20 minutes to 4 minutes. Although it might seem like an unorthodox idea, Washington, DC, wouldn’t be the first city to use gondola transit to alleviate traffic issues. The Portland Ariel Tram is celebrating 10 years in 2017, and former tram manager Brett Dodson told the Arlington Connection Portland's gondola has been a success, transporting over 2 million people annually, double what the city initially predicted. Initial feedback from local residents has been mixed. With the region’s metro system in a state of disrepair, some residents are concerned with local governments investing in an entirely new system. It’s also unclear who exactly would use the gondola and how practical using it would be for commuters. The impact the project would have on the Potomac and local boathouses in Georgetown is also unknown. Would the gondola better connect local residents and tourists to the Potomac? Or would the development be harmful to the river? If the project does move ahead, an environmental impact study would have to be completed, and the planning and approval process would take several years. Is a Potomac River gondola a good idea?